I've now broken two or three alternator tensioner brackets. I'm trying to figure out why. These blue poly bushings have been on the car since I bought it. I haven't had any issues with the other accessory tensioner brackets. 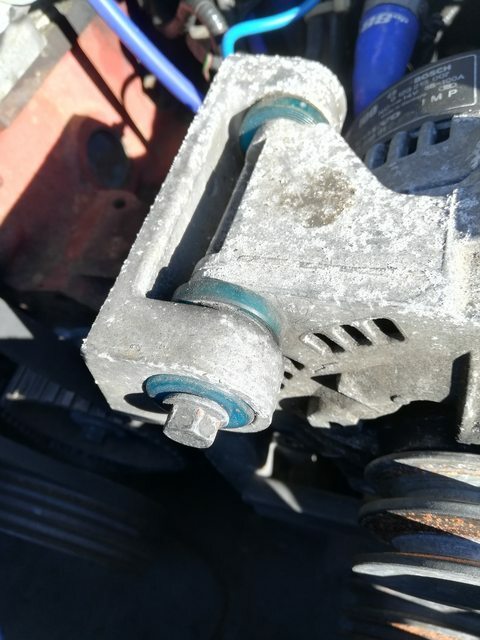 Do these blue bushings have anything to do with it, or do you figure it's a combination of age, fatigue, and bad luck? Too much tension? I doubt that I have the belt too tight, but maybe? Last edited by soclosenotnear; 01-06-2019 at 03:22 PM.. I've had 1 of those crack on OE rubber as well, don't think it's bushing related. Those bushings though tend to get hard as they age, compared to the rubber or Superpro stuff. The IPD, MTC, etc. ones turn to an almost plastic like level for some reason. I've had Superpro that are still flexible after 6+ years, but I've had the MTC crack as they turn brittle after a year. That said, I'd guess the bracket failed due to a combination of age, vibration, tension, all in one shot. 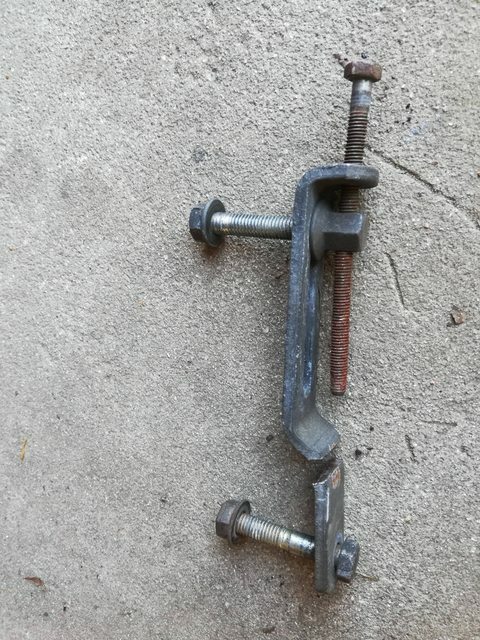 I've had a few brackets break on rubber bushes. That bracket design is really a piece of ****. I've had the bolt that goes into the block break off on two different 240s. The tension adjusting screw (takes 10 mm socket or wrench) is supposed to be backed off slightly after tightening all the other nut and bolts. I've also had to learn this the hard way. There should be a third rubber bushing at the other end of that adjusting bracket. Have you checked it's condition? The tension adjusting screw (takes 10 mm socket or wrench) is supposed to be backed off slightly after tightening all the other nut and bolts. I've also had to learn this the hard way. I want aware and didn't do that, for sure. There should be a third rubber bushing at the other end of that adjusting bracket. Have you checked it's condition? The third bushing is blue poly like the rest. Like the others said, it's probably harder than it should be but not like a rock. Doesn't seem that bad at all really. Judging from the grooves on the end of that bushing they are the old excellent quality ipd ones that are no longer made. I've been running a set of those for over 10 years and they are like new still. The newer poly ones everyone sells are pretty much junk. Except maybe Superpro, I haven't tried theirs. That said, even most people running the solid aluminum bushing replacements aren't breaking those brackets too often. How tight are your belts? As much as I prefer the newer style brackets with the tensioner bolt they do make it easy to get them really really tight. Unlike the old style, which are always on the loose side of ok. I think around 0.25" of deflection is recommended.